Aren't these lilacs amazing! The reach the second floor windows! They are even bigger than when this was taken 2 years ago. I think we only have one, maybe two, summers left in this house. It's time to sell. 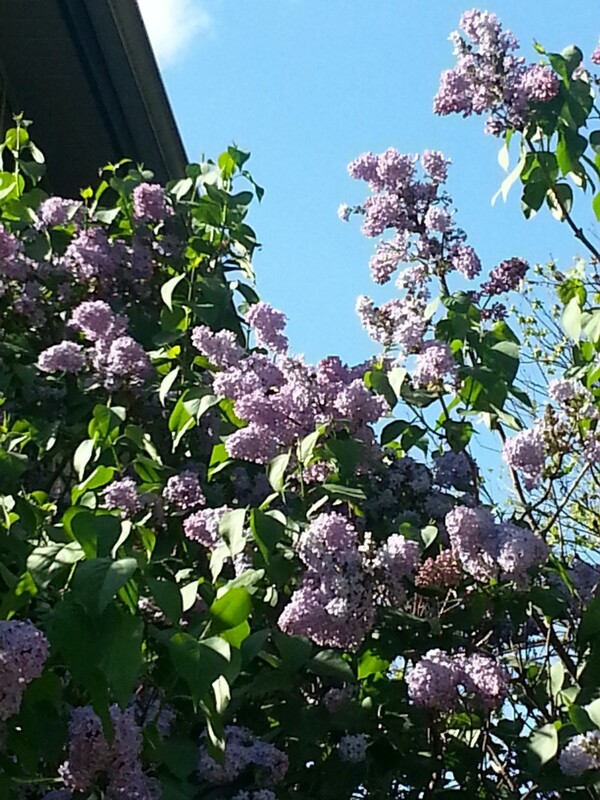 The lilacs were orginally from my uncle's house and were saved when the house was torn down. It thrived and was split into two. I want to bring some to wherever we go, and give one or two to my brother and his wife - they had a lot of land. What is the best way to do this? Save seeds (and how), dig up some of the younger shoots to plant, cut and root? Please advise. It means a lot to us. P.S. Please ignore the compost bins! I've had pretty good luck with rooting lilac cuttings. The plants are important and you have plenty of time. I suggest that you try 3-4 different methods. I know you can strike cuttings and you might try layering. Get yourself a bunch of young plants in pots, ready to be moved. You can try all three methods of propagation (four if you include air layering), but if you think you only have another year or two to be at that location then you are pushed for time and will definitely need to start the "babies" this year coming up. You want to ensure that you have several strong, very well rooted one or two year old babies already growing in pots and ready to take away with you. For seeds - I'd suggest you go online and search for websites with pictures that describe how to collect seeds from your bushes. Most of them will have pictures that show what are the best expired lilac flower heads to select, when to select them, and the best types of seeds to take from them. You will likely have to plant a lot of seeds to get just a few successful plants from seed because you won't know how many of the seeds are actually viable. Most people don't grow lilacs from seed because it takes longer for the successful seedlings to become well established and 4 or 5 years before the young plants start to flower. Young shoots are most often suckers that come from the roots of the parent plant, not from seeds - Search online for how to take up and propagate lilac suckers. You can take up suckers that are sprouting out of the roots around the base of the parent plant, make sure you take up suckers that have well established roots of their own and take care when cutting the main sucker root that attaches them to the parent plant. Take up and pot as many individual suckers as you can because not all of them are going to survive the shock of being cut off from the parent plant and you'll want to ensure you have a few strong surviving plants in pots. Plants started from suckers may bloom in 2 - 3 years after becoming well established and planted in their permanent locations. Rarely, but sometimes, they will start blooming the following year after being removed from the parent plant. Cuttings - Take several cuttings only after the lilac bush has finished flowering and the flowers have expired. Again, go online and search for how to select, cut, prepare, root and grow lilacs from cuttings and perhaps try both separate methods - rooting some cuttings in water - and/or rooting some cuttings in soil using a rooting hormone. Successful cuttings may bloom in 2 - 3 years after becoming well establish and planted in permanent location. In all instances, whether you try seeds, suckers, cuttings or air layering (or all methods at once), make sure that the pots you put them in have plenty of depth to them because lilacs will put down long, deep tap roots when they're becoming established and you need to give the tap roots plenty of room. If you don't move before two years is up, don't leave the established babies in the same nursery pots for more than 18 - 24 months at the very, very most or else they will probably die. Ideally, after 12 months in the nursery pots (18 at the most) they really should be either potted up in much bigger pots or else planted in the ground. Good luck. Your lilac bush looks absolutely gorgeous and strong and healthy and if it was mine I'd be wanting to propagate and distribute dozens of new plants from it. I just wonder if you could take it with you. I love lilacs but they don't grow well at all where I live. It's too hot and dry regardless of irrigation. A lilac will probably be one of the first plants I buy when I move in retirement. There was an old homestead adjacent to our property and it has about a half acre of lilacs similar to the OP's. Some of them did start on my property; but my parents gave us 100 Scotch Pine to plant for Xmas trees years ago. The pines grew up to where they blocked out the light for the lilacs on our property. So now I want to clear out the pines and replace them with fruit trees and more lilacs. I will use some of Zoisite's recommendations to replant that part of my property. 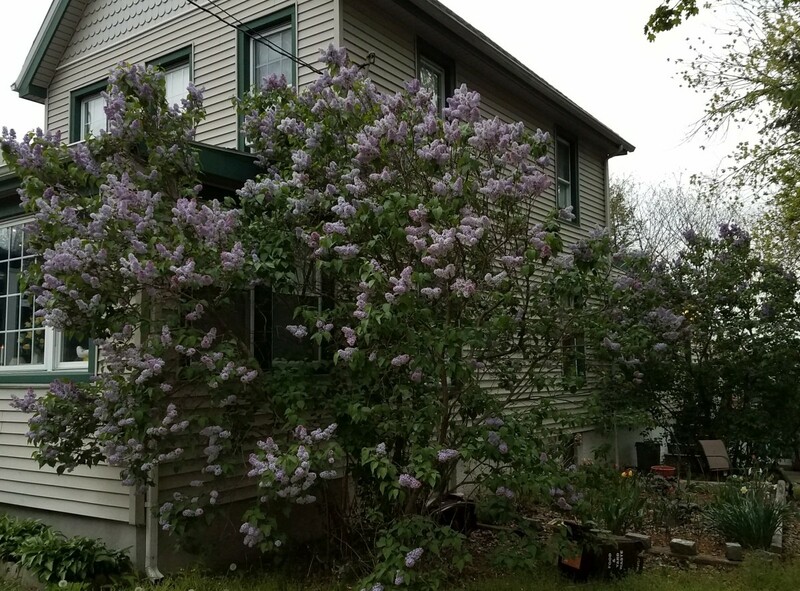 When the old homestead's lilacs are in bloom they are very fragrant. My wife always liked to have a few cuttings in the house for the smell; but they are sometimes loaded with ants. Last edited by fisheye; Yesterday at 02:58 PM..
You need to wait until after the lilac plant has finished blooming and the flowers have all died before you try any of those methods. If you try it before or during bloom you will have very little, if any, success.